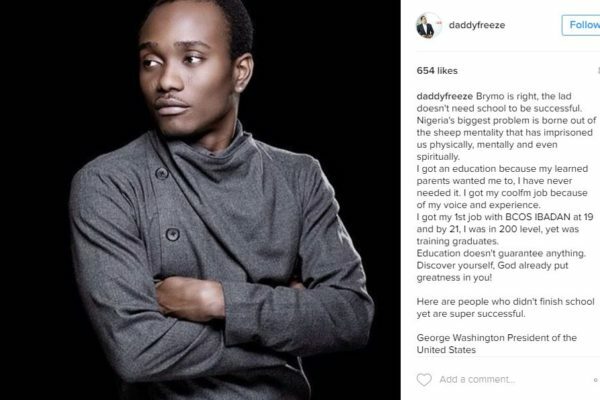 Brymo is right, the lad doesn’t need school to be successful. Nigeria’s biggest problem is borne out of the sheep mentality that has imprisoned us physically, mentally and even spiritually. I got an education because my learned parents wanted me to, I have never needed it. I got my coolfm job because of my voice and experience. I got my 1st job with BCOS IBADAN at 19 and by 21, I was in 200 level, yet was training graduates. Education doesn’t guarantee anything. Discover yourself, God already put greatness in you! Here are people who didn’t finish school yet are super successful.